A recent report looking at the future of the world economy published by Standard Chartered was a timely reminder of the cyclical nature of the world trade. Previous booms in trade have followed the expansion of western economies after the Second World War and before that there was a wave of openness and trade liberalisation in the late nineteenth century leading up until the First World War. All these periods were divided by times where trade declined thanks to protectionism and war. Right now, as the report highlights, a new wave of economic expansion is originating in emerging markets, which in turn has kick-started a rapid growth in trade between these countries, this in turn stimulates further demand and while this does not benefit all countries or people, it has helped keep world economic growth high even as Europe stagnates. The rise of South – South trade is both the cause and driver of economic growth in developing countries. 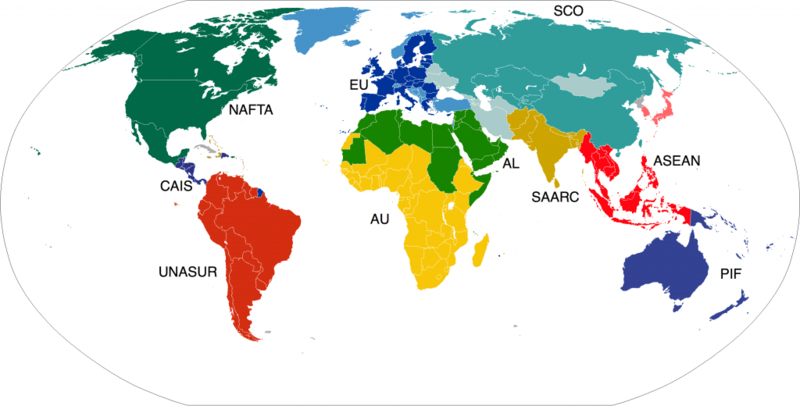 The major trade routes that exist today such as EU –US, East Asia – US and EU – East Asia will be challenged by new corridors of trade and investment such as; Africa –Asia, India –MENA, China – MENA & Latin America – Asia in the next 30 years, reshaping the economic and political landscape, if the west continues to economically stagnate and emerging powers continue their ascent, the world will be a dramatically different place. For example the report predicts that India – Middle Eastern trade will reach USD 2,700 billion by 2030 – up from just USD 23 billion in 2008, an unprecedented increase. It is well worth pointing out that predictions are quite often wrong, and this one is probably based on the assumption India will require huge amounts of oil, a fair assumption unless its GDP growth grinds to a halt or it can utilise alternative energy sources more effectively. As things stand South – South trade is dominated by natural resource producers such as Brazil and Nigeria and manufacturers such as China and Taiwan, the coming years should see some natural resource producers diversify into more manufacturing and services, while others get stuck remaining dependent on commodities to provide their income. New manufacturing giants will take on the work that China has become too rich to bother with, the “obvious” Asian countries such as Bangladesh, but also African countries like Ethiopia and Tanzania. The symbolic turning point of South – South trade outweighing North – South trade was reached last year. Now I foresee the further integration of rising powers and emerging markets into the world economy, and places such like Brazil and China losing their developing country tag as they catch up with Europe, the divisions between North – South, developing and developed will become blurred and less useful as time goes on. This increase in trade will be partly driven by economic growth and assisted by the increase of bilateral and regional trade agreements, the Doha round looks to be dead in the water and the WTO could see itself becoming less relevant as a complex web of trade agreements binds countries and trading blocs in different ways. Fast rising direct investment between developing countries will following on from increased trade links, we can look forward to Brazilian owned mega-farms in Africa, India having a major stake in oil production in the Gulf region and Central Asia and Chinese owned businesses just about everywhere. Some countries will remain riven by conflict, unable to change decaying institutions and poor governance. Countries that risk remaining in this trap are Somalia, the Democratic Republic of Congo and Afghanistan, but with a period of peace, half decent governance and some luck then perhaps they can also benefit from the boom in emerging economies. So this is a big deal – if it transpires, it basically involves a realignment of the world’s economic fortunes. Emerging markets will become the drivers of the world’s economy as well as catching up with the west on per capita terms. The balance of political power will tilt in favour of new powers and what are now emerging markets. Alternatively, we could see “business as normal” Europe and the US may retain their economic and political leadership, see an end to their recessions and their superior innovative and technological lead will allow them to retain their privileged positions.